Supermarkets in Gran Canaria: Which one is the best ? There are plenty of supermarkets in Gran Canaria, almost in every corner or within walking distance. Bare in mind that the price difference between one or the other can be up to 30%. Unless you have a car, we recommend you to buy all the lighter items in the cheaper supermarkets, and the water and other heavy items from the supermarket next to your hotel or apartment. 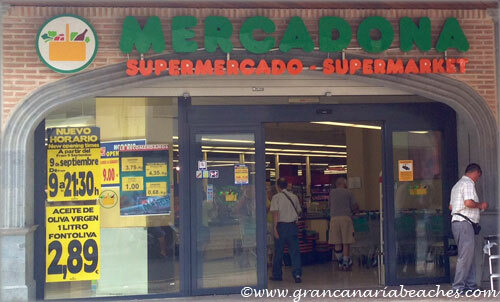 Mercadona: Spanish supermarkets. Their motto is “Precios siempre bajos,” or “Low prices always” – They are medium or big in size and are quite crowded, although the staff is efficient and lines move quite fast. It is rare that you don’t have to wait in line. Best deals are on their own brands, like “Bosque Verde” or “Hacendado”. The quality of their own brands is quite good. Plenty of shops throughout Gran Canaria. They sell food, cosmetics, and cleaning stuff. If you're allergic, or on a gluten-free diet, then this supermarket is the best choice. Unlike other supermarkets, Mercadona doesn't have a special over-priced gluten-free products section. Instead, they have decided to put a "gluten-free" logo on all products of the supermarket, that don't have this ingredient. There are over 900 products, including ice-creams of different flavors. For those of us with allergies, the new European law requires the names of the ingredients that can cause allergic reactions to be written in bold, and this supermarket follows this thoroughly. Mercadona of San Fernando de Maspalomas, located in Avenida de Galdar, very convenient if you're living in Playa del Ingles. Mercadona of El Tablero in Maspalomas, located in Avenida de las Americas street. Convenient for those living in Maspalomas. Alcampo: This is a French hypermarket, with only one facility on the island. It is located in Telde, between the capital Las Palmas, and the airport, in La Estrella shopping area. 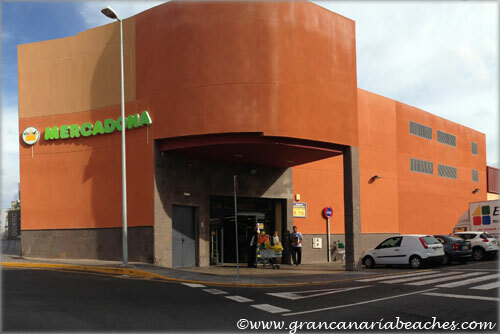 Big premises, very busy on weekends, because locals feel that it is one of the best supermarkets in Gran Canaria. They sell almost everything: clothes, electronics, computers, furniture kits, toys, as well as food. Carrefour: Another French hypermarket with four shops on the island. They are located in Vecindario in C.C. Atlantico, in Las Palmas inside C.C. Las Arenas, C.C. La Ballena, and Hoya de la Plata. They sell all kinds of food items, electronics, computers, furniture, hardware, toys, clothing for all ages. Best deals on their own brands, such as “Carrefour Discount” brand. Hiperdino or Superdino. This belongs to a Canarian group of companies, and they have over 60 shops distributed around the whole island. Supermarkets can be small, medium, or large.Generally they are medium. They used to be considered expensive, but the new Canarian owners are trying really hard to make prices competitive. The bread sold in these supermarkets is frozen bread that has been heated a few hours ago. The quality of their own branded products “Supersol” or “Hiperdino” brands is below average. Free delivery for orders over 60 euros. Click here to check out their latest offers. (Opens in a new window). Spar: Plenty of these all around the island. Prices not too competitive. Small or medium in size. Some of them have a take-away section of cooked food, which is quite reasonably priced. Lidl: German discount supermarkets. Lots of cheap food items of their own brands, and some offers of other items, but quite limited. Has six stores, located in San Fernando de Maspalomas (Bellavista area), Galdar, Ingenio, Arinaga, Vecindario, and Telde. Hipercor: Big Spanish supermarket located in C.C. Siete Palmas, in the capital Las Palmas de Gran Canaria. If you are looking for high quality items, this is the supermarket for you. Opencor and Supercor: These are Spanish supermarkets belonging to the Corte Ingles group. Unfortunately, their prices are too high and the Gran Canarian locals have said “no!,” and hardly visit them. The difference between Opencor and Supercor is that the first one opens almost 24 hours a day. Update July 2014: All Opencor supermarkets are now becoming "Supercor", and will be open only during normal daytime hours. Eroski: A Spanish hypermarket, located inside C.C. El Mirador. Prices are not too competitive and location is out of the way for most locals, so few people go there. There is a clever trick we recommend some of our friends to do, who want to take it easy and relax on the beach. If you're here for two weeks, it might be worthwhile doing your food and drink shopping online, the day before you leave your country (or better still, the morning you leave), and have it delivered to your apartment or hotel.